Recognised by industry as Ireland's leading Cyber Security programme. Delivered by expert academic and industry professionals this programme has built a huge reputation in Ireland and abroad. Offered in both part-time online and full-time on campus modes. The MSc in Information Security programme has a strong applied emphasis which is supported by in-depth theoretical knowledge. The programme was developed with significant input from industry’s leading Information Security experts. Designed to address the widening practical and theoretical skills shortage in Information Security the programme delivers content that follows best practice in industry. The continuing trend of skills shortage in this area is predicted to increase the global demand for Information Security graduates. Download the MSc in Information Security programme flyer here or by clicking the image over. Information security can be defined as the protection of information and information systems from unauthorised access, use, disclosure, disruption, modification, or destruction in order to provide confidentiality, integrity, and availability. Today, Information Security is becoming a function of increasing importance for the continued operation of organisations. The increasing level of interconnectedness of information networks and the reliance of business models on this interconnectedness has resulted in a network currently (the Internet) that has over a yottabyte of information stored, much of which is unsecured. This continuing trend is predicted to strongly increase the importance of Information Security within most organisations. Cork is the Information Security capital of Ireland with major companies choosing to locate in the region. Sometimes referred to as cybersecurity, information security can be defined as the protection of information and information systems from unauthorised access, use, disclosure, disruption, modification, or destruction in order to provide confidentiality, integrity, and availability. Companies with an Information Security presence in Cork are listed in the table below, please click on each logo for company details. This programme has a strong applied, hands-on emphasis, and was developed in consultation with many industry experts. It aims to fill the ever increasing skills gap in this area and delivers material that follows the most current practice. Please click here or the programme schedule button for full module details. Modules in this programme include Applied Cryptography, Digital and Network Forensics, Penetration Testing, Analytics, Network Security, Malware Investigations, Cloud Security, Information Security Law, Malware Reverse Engineering, Embedded Security, Software Security,Threat Intelligence, Offensive Security. Hands-on labs are provided through CIT’s private cloud giving students 24/7 access to state-of-the-art Information Security labs. Upon successful completion of the MSc in Information Security programme, the graduate will both understand and have the capacity to deploy many of the most advanced methods and systems to protect information at rest, in transit, and at work. 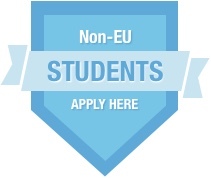 Entry will require a minimum of a Level 8 Honours Degree in Computer Science or a cognate discipline. The MSc in Information Security is a 90 credit programme, consisting of 60 credits of taught modules and a 30 credit project. It is expected that students will complete this programme in 12 months on a full-time basis. The MSc in Information Security is a 90 credit programme, consisting of 60 credits worth of taught modules and a 30-credit project. Full-time students will complete the programme in one calendar year. In the event that a student completes the 60 taught credits and is unable to complete the project (30 credits), that student can opt to receive the Postgraduate Diploma (PGDip) in Information Security. Indeed it is possible to apply directly for the PGDip programme. A student who receives a PGDip in Information Security, and who, after some time, decides that (s)he wishes to complete the MSc, has the option of revoking their PGDip, completing the 30-credit project and then presenting themselves for the MSc in Information Security. 12 months (3 semesters) is the minimum duration. The following article was recently published in the Sunday Independent, Ireland's highest selling Sunday newspaper. 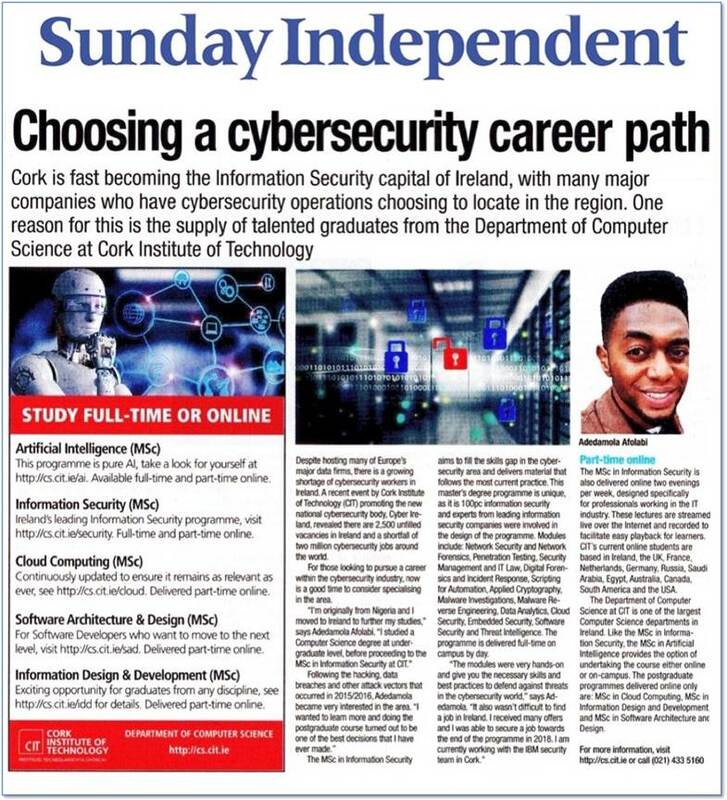 The article features Adedamola Afolabi who is originally from Lagos in Nigeria and now works for IBM Security in Cork. Entry to the MSc in Information Security will require a minimum of a Level 8 Honours Degree in Computing, Computer Science, Electrical/Electronic Engineering or in a cognate discipline. Applicants who do not hold a Level 8 degree but have significant industrial experience will be considered on a case by case basis.